Many people think of December as the run up to Christmas, I think of it as the UKOUG Conference. This year was even more special for me as it was my first time at the helm, although it is my 9th conference all the rest were with Ronan Miles in charge. This reality didn't really hit me till just a few days before the conference, followed quickly by a lot of nerves. The other thing that was very different was that previously I would have been very involved with the office right up till the event itself but with the new executive my involvement was quite limited, that also was quite stressful in its own way. Finally to add to the pressure, I had had to take over the arrangements for the Fujitsu stand in the exhibition in the run up to conference although I had passed over ownership during the actual event. So I stupidly took on all that stress on myself, which was silly, UKOUG is about a professional staff, a great executive and almost 200 dedicated volunteers, and they did me and you proud. By the time Lisa and I left the stage after the kick off for the event I knew everything would be OK. 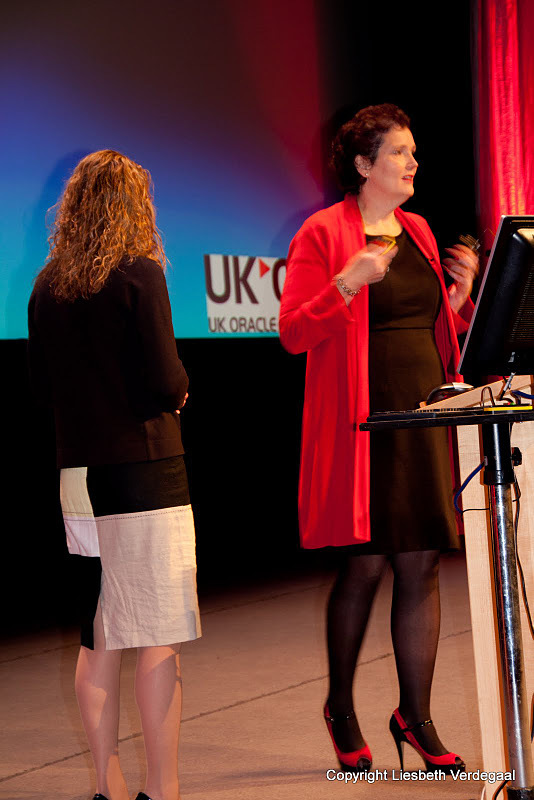 I have always said I am proud of what UKOUG achieves but this years conference was excellent. As in every year we have a lot to learn, feedback to process, and I am expecting a lot more this year with the availability of the mobile app. We will always strive to get better and never be complacent but everyone seemed to be enjoying themselves and the conversations I had were full of praise. You can see people enjoying themselves in the photos that Liesbeth took, and read plenty of blog entries and the press coverage we got during the event. I loved Mark Sunday's main keynote it was great to hear a customer case study, especially when the customer is Oracle themselves. Our other two plenary keynotes were Cary Millsap who I wrote about before and his amazing and personal look at life, and Ray Wang who gave us an excellent analyst insight into Oracle and IT. Our community keynotes were very well received and gave their communities the insight they needed. We are very popular with Oracle executives, product management and speakers both local and overseas, so the standard of presentations was as ever very high. The Oracle UX team were out in force as is now their custom, adding to to the Fusion Apps content. Also many of the community keynote speakers also hosted round tables were delegates got the chance to ask all their questions directly. We had our IPA winners that I was not able to attend but Lisa did a great job handing out the prizes and thank you OTN for sponsoring these again along with the ACE dinner on the Sunday night. I wanted the community spirit to be lifted at conference and it was, the Focus Pubs were an opportunity to mix with your peers, the OakTable Sunday was a great success and their OakTalks were an unexpected bonus. The exhibition had a great presence from Oracle and a lot of exhibitors who help Oracle customers get the most from their investment. The masquerade ball was a great chance to let our hair down after 2 very long days and before the final but still packed Wednesday. Yes the days were long and those who did not stay in Broad Street, either commuting or just able to make a single day it was too long, but what do we do? This is were we really need you feedback, do we cut back on content or networking? Do we lengthen the conference, do we start main sessions Sunday? Tell us. So yes, I was silly to worry, it was a great conference, I was proud of what UKOUG delivered and to be the President our your community.